For nearly 14 years, DIRTT has been pushing the limits of technology and design to be an innovator in one of the world’s oldest and largest industries — construction. One reason that DIRTT has been so successful is their extensive and strategic worldwide partner network. Mogens also believes that sustainable growth is not possible in any marketplace without the support of engaged local partners – those organizations that have feet on the ground and work with clients while supporting local economy. Being a DIRTT Partner can sometimes be confusing to client partners and the local A&D community. We often get questions like: Are you a DIRTT or RJE employee? DIRTT’s HQ is in Calgary, but you have local reps? What does GLC stand for? And did you call Mogens a DIRTTbag?! Let’s break down what it means to be a DIRTT Partner. The first fundamental step in being a DIRTT Partner is to have a dedicated Interior Construction Team. Our local Indianapolis team consists of an Account Executive (myself), a Project Manager (Justin Reboulet), a Design Director (Abby Burgess) and a Designer (Amber Gortney) who focus strictly on DIRTT construction projects. As a skilled Partner, we are all proficient in DIRTT’s game-changing ICE software and are fully immersed in the latest and greatest DIRTT solutions on display at our Green Learning Center (GLC). RJE as an enterprise is committed in all our markets to growing our Interior Construction Division and is continually investing in the latest technology and continued education as the landscape of interior construction changes. We believe in the DIRTT method of construction and are dedicated to providing an exceptional customer experience with every project that we touch. Who are these “DIRTTbags” you keep referring to? Yes, you read that right. At DIRTT, there are no personal offices or formal job titles (besides the legally-required Leadership Team), but instead, DIRTT lovingly refers to their employees as DIRTTbags. Just like DIRTT, their employees are innovative and creative. Both enthusiastic and fun to work with, DIRTTbags are the experts on all things DIRTT and are always ready and willing to host you at the Calgary HQ. We are fortunate to have Ann Armstrong as our local DIRTTbag in the Indiana and Ohio markets. Ann is hitting the ground daily, championing DIRTT and supporting RJE’s needs as a DIRTT Partner. Ann is also connected to a network of global DIRTTbag Specialist Teams in markets like Healthcare, Education, Government and more; and, she often brings them to the market to speak on trends in construction and design. A DIRTTbag is a special breed of change agent—passionate and engaged in driving the DIRTT vision. Okay, so I understand the difference between the RJE and DIRTT teams, but who ultimately builds my DIRTT solution? Magicians in the field, that’s who. All DIRTT projects are built and maintained by certified DIRTT Technicians with previous wall installation or carpentry experience. All DIRTT Technicians undergo hands-on training with DIRTTbags in Calgary and are certified by completing jobs in the field. RJE Indianapolis employs a team of DIRTT Technicians, but also has a host of local resources to pull from for larger projects requiring additional manpower. One of the main drivers for DIRTT having certified technicians is to uphold their stellar 10-year warranty. If your DIRTT solution is not built properly, there is no way to warrant it! So, we aren’t just pulling anyone off the street to build our solution — we are using aptly-trained and certified workers. Being a DIRTT Partner sounds pretty rad! It is! DIRTT has more than 100 partner teams worldwide that span from the remote reaches of Alaska to the hustle and bustle of Dubai. Add our technicians and DIRTTbags to the mix and we’re ready to help you with any project needs. If you ever had any doubts that DIRTT’s network can support your needs, you can rest assured that our team is ready to deliver your custom, prefab interior construction solutions quickly and precisely. 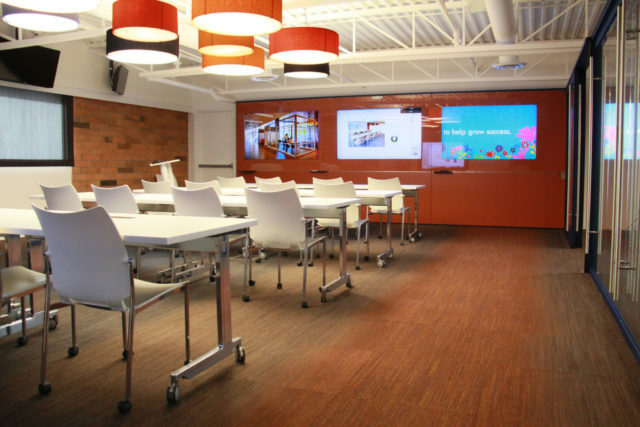 Check out more of Kelsey’s insights on DIRTT & the future of interior construction here.